Change and development in the Douro Valley over recent years hasn’t just concerned its famous Port wines, but the creation of a whole new premium table wine industry using the region’s historic vineyards and traditional grape varieties. The famous Barca Velha Douro red from Sogrape was launched in the 1950s as a forerunner, but this category has only really become established over the past 20 years. 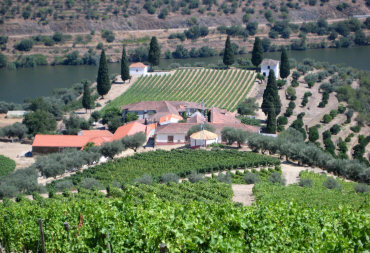 Though basic red wines for local consumption have always been produced in the Douro, the fortified Port wine industry completely dominated the region from the 17th century until 1986, when Portugal joined the European Union. Until then, the powerful Port lodges enjoyed a virtual monopoly of production, with regulations controlling what type of wine could be made and how it could be sold. Accession to the EU and adoption of its laws swept much of this aside and allowed independent producers to grow, bottle and sell their own production. Given the history and quality of the Douro vineyards, and the high cost of production in the region, the producers who first seized this new opportunity did so with the sole intention of producing high quality fine wines to compete with the best of Europe and the New World. Producers like Dirk Niepoort launched his Redoma in 1991, whilst many others followed over the next few years. In 2003 I tasted only the second ever release of another new Douro wine with huge ambitions, called Chryseia. That wine – the 2001 vintage – was extremely impressive, and so it should have been given the heritage and experience behind it. For decades Bruno Prats’ name was synonymous with the Château of Cos d’Estournel in Bordeaux, where he was CEO and winemaker until 1998 when his family decided to sell the business. 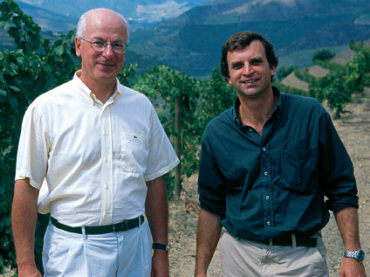 Prats then turned his attention overseas, establishing wineries and joint ventures in Chile and South Africa. In 1998, the Symington family approached Prats to form a new joint venture in the Douro Valley, where Prats would apply his Bordeaux winemaking skills and experience to premium fruit from the Symington vineyards. As owners of Warre, Dow, Graham, Smith Woodhouse, Gould Campbell and more, the Symington terroir married to Prats’ expertise was potentially a marriage made in heaven. Bumping down an impossibly steep dirt track through the vineyards to Quinta de Roriz is a white knuckle ride I would prefer not to endure again (our driver, in his saloon car, had taken a wrong turning and was negotiating several hundred vertical feet of crumbling slate, normally reserved only for tractors). But the view was spectacular. Looking down to the estate buildings of Quinta de Roriz from this altitude, the ‘Chryseia block’ is clearly laid out on its little promontory jutting above the Douro River (click picture for larger version). Roriz has been the home of Chryseia for only a year, following Symington’s acquisition of this prestigious property and its vineyards in 2009. I met up with winemaker and manager of Quinta de Roriz, Luis Coelho, who showed me around the property. It is a beautiful old estate – a little village in its own right complete with church – and the vineyards. Luis (left) explained that Touriga Nacional is the backbone of the blend for Chryseia, and is the dominant grape across all the Symington properties. Also used, depending on the vintage, are Touriga Francesca, Tinta Roriz (Spain’s Tempranillo) and Tinta Barocca. The latter grape is very important on the Roriz estate, but Luis says for him it is the Touriga Franca that is one of the most important components of Chryseia: “Touriga Franca gives freshness. 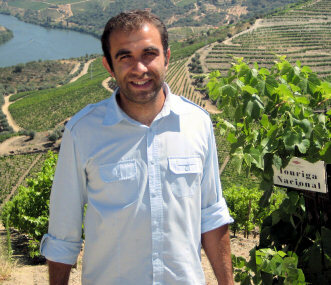 It has lower sugar and is later harvesting – it complements the power and tannin of Touriga Nacional.” Some newer vineyards are planted vertically, not on terraces, but are mixed plantings of different varieties “like in the old days,” according to Luis. Though production of Chryseia and second wine Post Scriptum has now switched to Quinta de Roriz, fruit is still sourced from various Symington properties including Quinta do Vesuvio and Quinta da Perdiz. The winemaking remains the same, with some maceration and pumping over for a gentle extraction and ageing in new French oak, though these are large 400-litre barrels to soften the oak influence. Bruno Prats and Charles Symington are very much hands on in the making of Chryseia and its second wine, Post Scriptum, and Luis sings Prats’ praises, especially for the Bordelais knowledge and finesse he has brought to the wine, which Luis says is “all about the blending.” When pressed further, Luis says he believes Prats has ‘tamed’ the Douro style noticeably to give Chryseia and Post Scriptum more elegance than many other reds from the region. The 2009 wines were the first to be made at Roriz, and time will tell if the style is altered. Barrel samples were very impressive. for tasting notes on Chryseia and Post Scriptum.